Women are being left at risk of stillbirth due to a lack of proper screening for gestational diabetes, new research suggests. The study involved pregnant women at 41 maternity units across the UK. It found not all women who were at high risk of developing the condition were tested as they should have been. It found 26% of those with the high risk factors of having a high BMI or being of South Asian or Black Caribbean ethnicity did not get screened at all. Left untreated, the condition can increase the risk of complications. These complications include a baby that grows larger than usual, leading to problems in labour; premature birth; pre-eclampsia and stillbirth. Gestational diabetes - high blood sugar that develops during pregnancy - happens if your body cannot produce enough insulin to meet the extra needs in pregnancy. This latest research - a Midlands and North of England Stillbirth Study (MiNESS) was published on Wednesday in BJOG. It looked at the symptoms and care of 291 women in the UK who experienced a stillbirth compared to 733 women who did not. 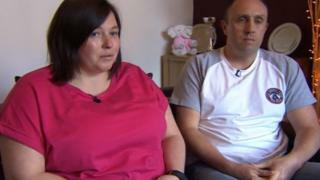 Gaynor Thompson from Halifax, West Yorkshire, was just two weeks away from her due date last October when her baby stopped moving and died. After her daughter was stillborn, she had various tests and doctors concluded the most likely cause was undiagnosed gestational diabetes. Miss Thompson thinks those at risk should be tested routinely after 26 weeks, and a secondary compulsory test should be done later on in pregnancy. She said: "What matters is going forward, what the doctors, the consultants, the NHS can learn from parents like us and [our daughter] Kallipateira, and action must be taken. "There are far too many healthy, fully developed babies dying, which we do fully believe are preventable." It found women who have gestational diabetes but go undiagnosed are four times more likely to experience stillbirth than those without the condition. The study, funded by charities Action Medical Research, Cure Kids, Sands and Tommy's, involved pregnant women at 41 maternity units across the UK. Experts from the universities of Manchester and Leeds worked on the research. NICE recommends all women at higher risk should receive blood screening for the condition, but only 74% of women taking part in the study who were at risk were screened. On average, woman at higher risk of gestational diabetes who were not screened according to NICE guidelines also experienced higher risks of stillbirth. Who's at risk of gestational diabetes? "The good news is that women with gestational diabetes have no increase in stillbirth risk if national guidelines are followed for screening, diagnosis and management. "The bad news is that the guidelines are not always followed and some women therefore experience avoidably higher risk." Co-author Professor Alexander Heazell, from the University of Manchester, said: "It's not clear why some women missed out on being screened or diagnosed for gestational diabetes, but this needs to be improved. A spokesperson for Public Health England said the UK National Screening Committee (UK NCS) welcomed the report. She added: "Although population screening programme for gestational diabetes is not recommended in the UK , diabetes and its complications during pregnancy are managed in accordance to NICE guidance. "The UK NSC is looking at the evidence to screen for GD as per its published review process and will open consultation later in the year. The UK NSC will take into account any new published peer reviewed evidence since 2009." iWonder - How can I reduce my risk of diabetes?